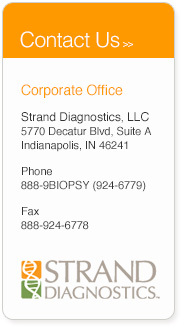 Watch our company videos to learn more about Strand Diagnostics and how Know Error can enhance diagnostic accuracy and patient safety in the surgical biopsy evaluation process. Watch the overview of Strand Diagnostics’ Laboratory and learn how Know Error enhances diagnostic accuracy. Talk to your physician to find out more about Know Error and how to Be DNA Certain your biopsy belongs to you.